Thought We needed a place to drop General Messages on Boat locations so we dont "wonder off the beaten track" on some threads (Guilty as Charged i'm afraid). This was sort of what I was getting at with the "boats" thread, so people could add boats they'd found or knew of and maybe a new topic started if sufficient interest was found? Didn't really work but hey, I tried! Might Work,but we need to find all the survivors,you not wrong. Did The UK Sell any MTB/RTTLs/HLS to the Middle east? HDMLs 1081,1389 and 1397 were sold to Iran in 1948/9;have you come across something interesting? and the same design as the 41 ft hull? Says the Hull was in good order! He Thinks she was a ST or a Navy Launch of some kind, he gave me pictures of her when he had her. I will scan and post! Looks like she could've been post-war JS White-built Admiralty FMB;what do you know about her?There were some wartime-built BPB craft of this approximate size,but I must admit I don't see the similarity,for starters the stem curves the wrong way (chine to deck)and the entry is too fine.When was she built?What is her beam?How many engines?Is she on a brokers page?Tell us more! She is the one in Balloch Marina. Was Talking to Don about her...trying to get someone to look her over soon as possible. The Previous Owner just phoned me and I will meet him this week for a chat...and I have some more leads up this way! Oh and my mate is in Basra and says he saw some MTB type wrecks on the river bank....He thinks PT's? Re Basra MTBs-Is your mate allowed to take pics of that kind of thing? I'll ask him to send me pics over he sould have a camera...or get some myself. I'm still trying to find out the type.Do you know or can you find out her name and previous names? 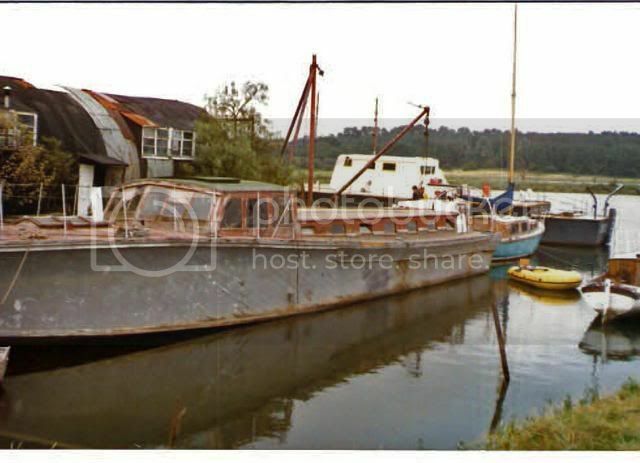 Her Name Was "Trico" when owned by Jim Lynch...meeting him this week for a chat....more info to follow..
Jim was up in Arbroath short time back and says there is a MTB in the boat yard up there....Anyone?? Pity I never found out what the "Balloch ST" was..
Looks like she is 'Zeta' a Brooke marine craft that sold in Southampton a year or so ago. I had heard that she had gone to a museum of some sort. 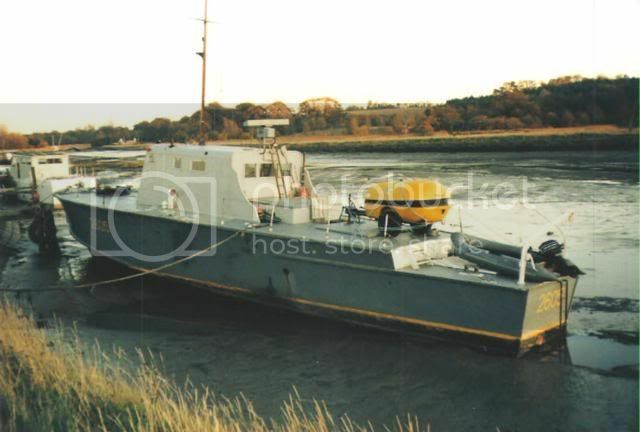 I'd love to know more details as I was told she is the last WW2 Brook marine craft afloat. Brooke Marine were from Lowestoft where I am hopefully getting a berth shortly. 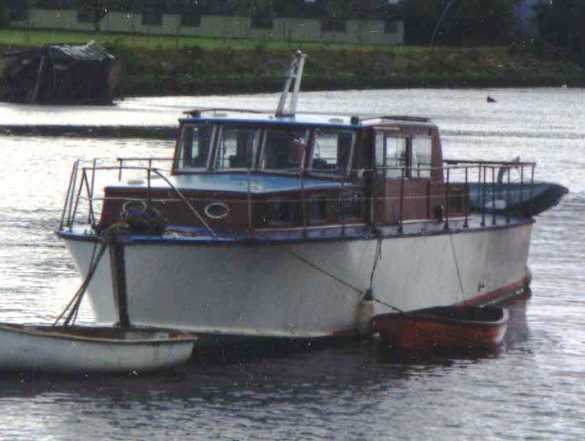 Re the Balloch boat, I've uploaded some photos of her sent to me by Jim. Glad to have someone on my side here, the other clincher is that the G&G builds had their cutless bearings fitted externally and the JSWs internally, from Don's "ST" gallery you can make out the external bearing housings, interestingly also the rudders which are certainly not BPB if original.The G&G GA drawing unfortunatley does not show the lie of the planking, but if you look at the Blue Peter picture she has the same planking direction and she is a G&G build. As you say, the fact that she was triple shafted and 48ft are of prime importance, but I do wonder if that length includes the subsequently added bathing platform, as the yard owner would certainly include that as part of the LOA for billing purposes.If the platform accounts for 2 1/2ft she could possibly be a BPB Bird Class, I am at a loss to think which other wartime BPB she could conceivably be. I think it is sadly unlikely although it would be great if she were a Bird Class, the very last one is on the public hard at Shoreham awaiting breaking-up (Regulus ex Hawk). 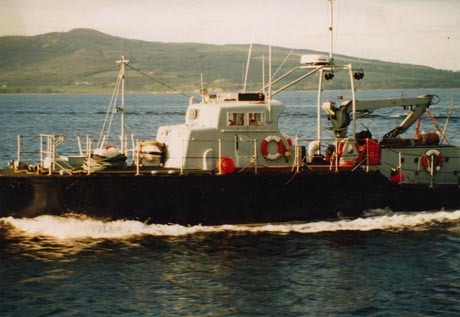 Re the Balloch boat. . Im looking for something that cam be used as a tool store and possibly accommodation in the short term while I work on Pinnace 1262 at Irving. As for knowing these boats, well I guess I will happily say that I wont turn away advice. If the Bolloch boat can be made watertight in a few weeks/months of full time work then I will happily take her on depending on price. 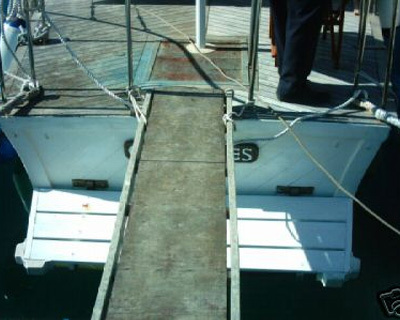 The pictures in dgray’s post would suggest considerable deck work required to make her safe. How long do you think it would take to make her hull safe to move under her own power, (I f possible at all) ignoring the inside and running gear? There will plenty of time once she is at Irving to do further repairs. I’m not concerned about her interior, its either that or a static caravan or possibly sleeping in the back of my van while working on the Pinnace 1262. I’m a mechanic and welder and by trade , So id expect to be able to sort the engines quite easily. So all being well and if not to much work is required on the hull I would believe that id have her shifted from the yard quite quickly. hi, re zeta. i know the owner of this vessel & he has no knowledge of it sinking. it is at present moored at the river hamble ( due to be moved hopefully to ramsgate around december) & he was contacted by the boatyard very recentlyto see what was happening to it as he had not contacted for a while due to hospitalisation, as i say, no mention was made then or since about anything untoward happening. in fact they mentioned as he intended moving it, did he want the engines serviced. he was quite supprised when i told him what id just read. can anyone confirm what is going on. the information he has on the boat is that it has had major restoration in 2001 & was due to go to the bpb museum but got sold instead. mmm Your right it is Balloch . when were the propeller's counted? From my recollection there are only 2. I am working from recollection, but the I seem to remember that the construction suggested to me that she was pre-war, probably mid thirties, but I am not particularly familiar with the Darby Winners, so it could be a re-engined candidate. Has anyone actually measured her? I think that she would be quite good for that and have enough space. The easiest way to shift her would be to build a shipping cradle under her and then truck her. It would be much quicker and more guaranteed than trying the marine route. It is also a lot easier and cheaper than you think. After all you will still need to negotiate the barrage at Balloch and then the tidal shoals of the River Leven which are not charted or maintain, despite the plans of British Waterways. it is now normal to truck out from Balloch. There are several local companies who know what they are doing on that front. I can give you some pointers if you would like to look at going that route. What is the plan with Pinnace 1262? There is a lot to do to even get her to look the part, let alone to get her straightened out and structurally sound... Good luck. I think the boat has to float out as I seem to remember Jim saying that trucks cannot get to that marina now. I also heard that in Scottish law that it takes 7 years before then boat can be considered abandoned and disposed of by the yard. I apologise for the poor quality of the images below but I think the Derby class ( bottom image) is a lot beamier than the Balloch boat (top). I add a small photo of my little boat as a comparision. 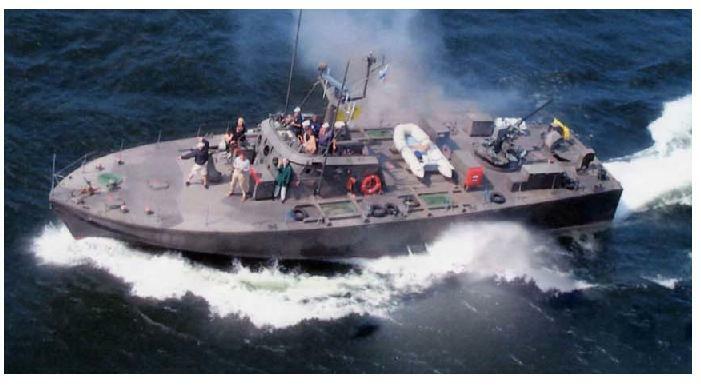 There seems to be a design similarity to the Balloch boat if you look at the flare of the hull. Re number of props as quoted by Jim on page one of this topic. Don, the answer is that there simply weren't any 48ft Seaplane Tenders I'm afraid. The beam looks about right for a DWC, the closer you get with a camera lens the more the image will distort, your picture in the slings has been taken from a much greater distance away than the recent bow-on view taken at Balloch. Have spoke to the Balloch marina this morning. 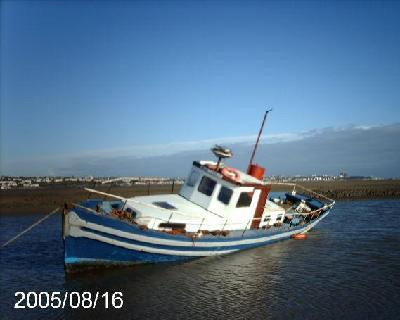 They intend to sell the boat once as they have legally advertised for the previous owner. Apparently she has been there for about 10 yeas and was sunk before that. There is a number of people interested in her for her shafts etc. Due to the expectations that she will be dismantled the marina will be looking for sealed bids around April as they expect to have room around her then to do the work. Anyone interested is advised to keep in touch. So sounds like she’s no good for me. Having looked at dgray’s pictures again I think there may be a serious issue with the fact that the cockpit cabin floor has been removed. If this was part of the deck then the front and rear side decks with have nothing holding them up amidships. Cabin off to replace centre part of deck? Probably not a problem if it was a step down to cabin floor. As for the Pinnace 1262 , well I guess I could easily fill this website with spam about what I intend to do, Probably best if anyone is interested to private message me with your email and I will bore you that way J .
P.s anyone got a set of engines for me to rebuild? Cheap lol. In respose to AndyS here is my best compromise between size of image and size of file for the Derby Winner line drawing. This comes from Caxton's 'Modern High Speed Oil Engines' where it is reproduced specifically by courtesy of Groves and Guttrige Ltd. I also attach another Derby Winner (JSW) bow shot for comparison. The spec. breadth is 11'6'' O/A (11'0'' moulded). For the class which has a total of 21 boats there is quite a variety of detail difference between them. 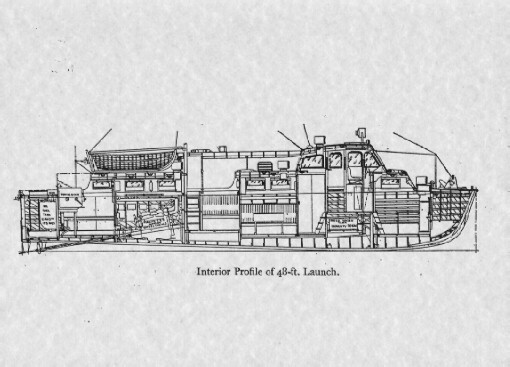 Two builders with differences as discussed above with each builder producing both the forward wheelhouse and the centre wheelhouse versions. Home or tropical service spec. 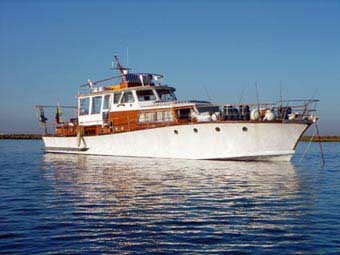 (with different draughts, mahogany or teak in hull, copper paint or copper sheath and exrta fans and a sun roof for the tropical spec). 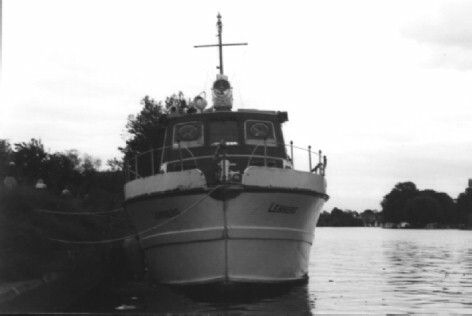 Another small but inconclusive similarity is that the fairleads on the stern look identical to those on Lemberg. I know that there are no 48' seaplane tenders ( did I put my foot in it and say that there were?). This boat is a bit of a quandry as she seems to tick a lot of boxes on both the BPB and DWC boats. 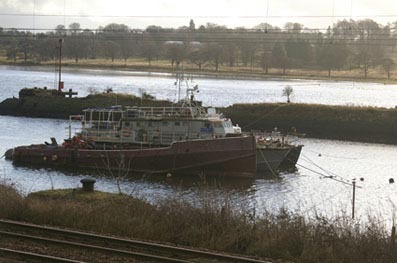 For example, there is a photo of Blue Peter in the water and the hull seems identical to the Balloch boat and the diagonal planking issue is resolved. Yet, when I look at the exterior hull photos (looking aft), I'd swear that the Ballock boat is a BPB boat as the flare of the hull is, to my very inexperienced eye, a BPB 'ST type' hull as it seems less 'beamier' than the DWC Class. Perhaps it's just the photos. I'm sure I'll stand corrected but regardless, I hope she is saved next year. More pictures of Lemberg are available, but this may not be the place to put them as I know where Lemberg is! 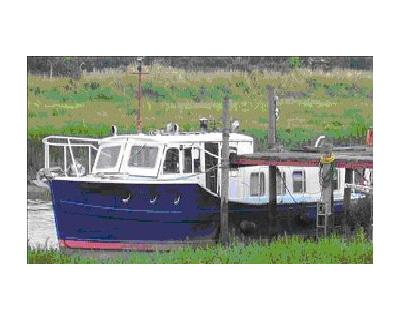 Try my advert in the 'boats for sale section' there are half a dozen more if you click on the index page photo, while I tackle the technology to put an album somewhere accessible. Thanks David. I've ordered the 3 vol. set of Caxton's 'Modern High Speed Oil Engines' I look forward to reading about them..
63ft British Power Boat Company HSL converted to a motot yacht. She is located in Lisbon and wait for it she is priced at Euro 750,000 about £500,000.Somebody should buy 32 from Christians father,what a bargain. Finnish Navy Boat from the early 60's and still in original sea going condition. Already one in this country(any body know where?) 0ne of the 3 or 4 remaining. glad to hear the interest in the "Balloch St?" Anyone heard of a fast wooden hull in the boatyard in Arbroath? Hope all is well. Glad you've got some leave. Pervious owner said she is 48..odd size i know! Think the only way we can put the "size thing" to sleep is to measure her...will do this this week.. Thanks Jim. If she's 48 then she is most likely a Derby winners class boat. Interesting to know if she ever had a 3rd shaft. Derby Class? Might well be!....the previous owner swears she is a 48! The Hull looks similar...chin line looks same..be nice if it was. Just seen a couple of mtb's on sothebys brokerage site. no other imfo found and to busy to chase up at that price. I have just been sent this by the seller. We have now checked further into this craft and have now been informed that it is a Hagg power cruiser, see below for updated inf. Class. Hagg Power Cruiser, we have now checked out the craft’s history and emended accordingly. Type. 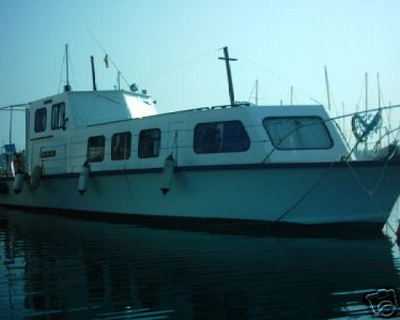 Project, Refurbished and partly converted into liveaboard craft. Standing headroom throughout with rear loading doors in transom. Hull Material. Timber, steamed frames, double diagonal, fully cascover sheathed since ashore. Keel. Long straight keel, fully sheathed. Engine. No engines, original were Jaguar 6 cyl. Petrol, but all stern gear in position including propellors. Accommodation. Possibly 6 berths in 3 cabins. Inventory. Sea toilet. Full fitted winter cover on craft. years under a heavy duty fitted cover. Some fitting out could be undertaken on site. This vessel is the nearest i can find on net. Aah, that explains the shape. Nice project for someone. Has anyone considered the helm position? Hyperion and Blue Peter both have port side position, cannot vouch for the others but the Balloch boat appears to be central. In them You can see that the current helm position is indeed central. It's hard to tell it that's the original position though. Before anyone says anything the pics did work for about 5 mins! Once I figure out how to keep them up for longer I'll try again. Happy New Year to anyone reading. Please find attached your photos, I have taken them from flicker and reduced to below 50k for uploading. She is now called OSPREY (See other posts on the site for other photo's) She is Ex RTTL Mk II- 2770 built by Saunders Roe in 1959. I would be grateful if you could confirm her current where abouts. Thanks for that, she's currently at Bowling Harbour just outside Glasgow. Dont know how long she's been there but i'm sure it's at least 2 years now but this is the first time i've managed to get a picture. 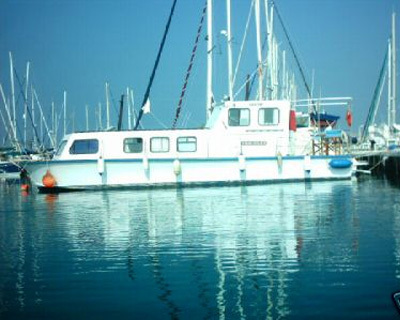 1955 Mk1 PINNACE - 63ft x 15ft 6" - £28,000. 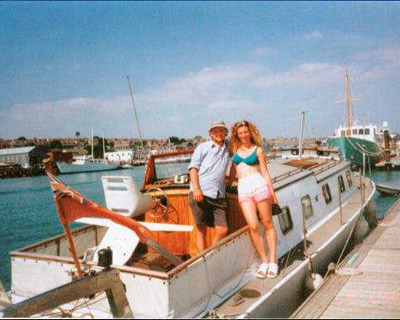 If you look carefully at the boat behind in the photograph you should be able to identify her current location. The contact details are in the advert. 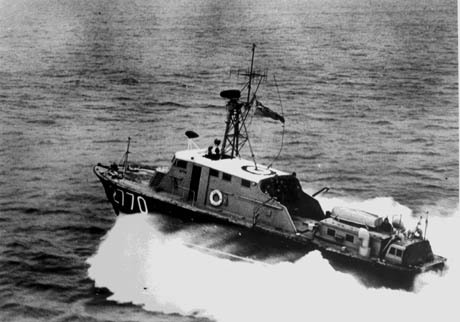 Would anybody be able to identify this boat, is she the same type as SAMURANG? That looks like Les's Pinnace. 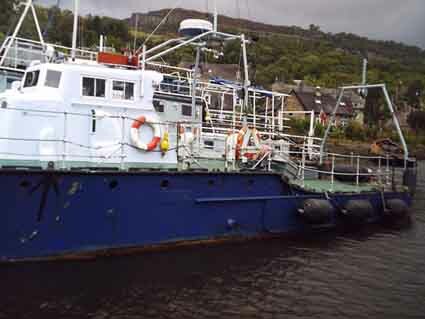 I can not remember what she was called but she has spent a lot of time in and around the Clyde and Holy Loch. I have not spoken to Les for several years so I do not know the status. 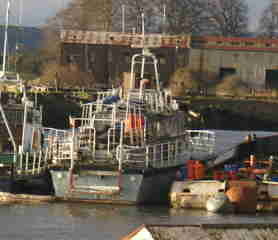 Both of these boats used to work together doing diving and moorings, until Osprey was sold to the current owner. 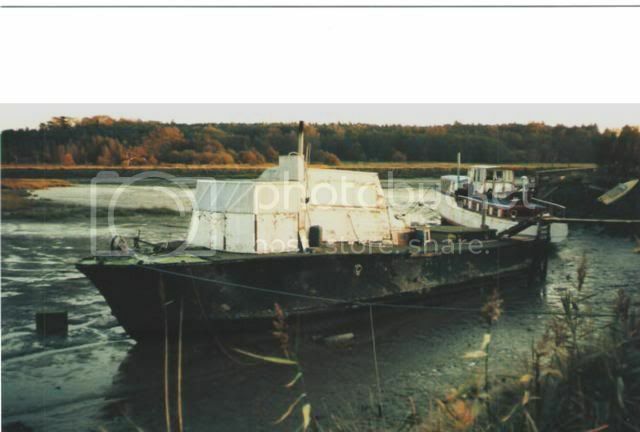 Hello, the pinnace in the photo is an ex RAF GS 63ft pinnace - service number 1381. She did carry an E after her number for a while when on charge and this related to the experimental use of different gearboxes. The boat as far as I know is still on the Clyde. Hope this helps. Another view of Aquila Maris whilst at Glasgow. What happened to her Hyab? A lovely shot of Osprey in service (from Donald Smith). Anyone got GSP 1381? For those of you who have not worked it out, former GSP 1381 is moored alongside former RTTL 2770 Osprey in Bowling Harbour on the Clyde and can be seen on the pictures further up this page taken by Garethep recently. As your are familiar with OSPREY would you be able to confirm the engine/gearbox arrangement that she is currently running and the speed that she operates at. The contact name for the GSP in the ad is Kenny on 07915360236. What does Osprey currently do and is her future secure for the forseable future? 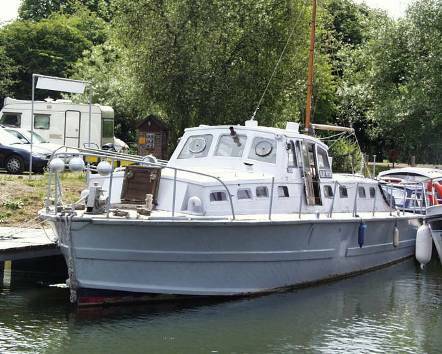 I'm become interested in old WW2 boats and I'm thinking of buying one of my own (with a mate). I don't mind a bit of work but a major refit is proibably beyond my capabilities and wallet. Our budget is limited to only £20k (that's a big limit) and she must be ex-RN. I guess anything over 65' would be too big and anything under 40' too small. 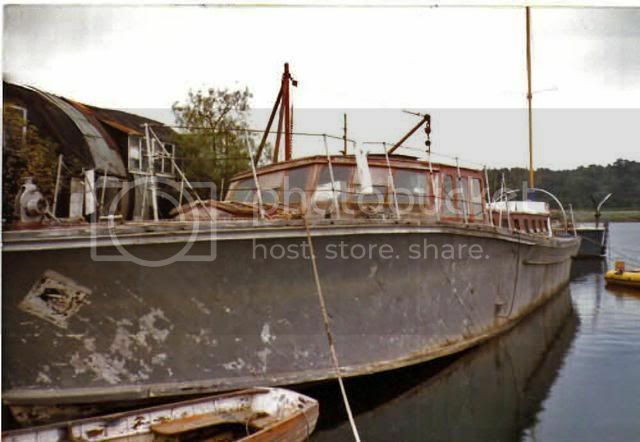 Are there any early 55 or 60' boats for sale? I'd be obliged it if you could you let me know of anything, ex-RN that might be for sale. For what it's worth, there are plenty of hulks out there for next to nothing but, unless you have very deep pockets, my ha'pence worth of advice is buy the best you can as you'll save a fortune in the long run. I’m going to stick my ore in here. I would advise anyone who is thinking about buying a hulk to forget it. Yes the idea is good and yes they are cheep and you will love your vessel. But I guarantee you will be kept awake at night wondering what the hell your going to do and wondering where your going to find the cash. Everyone will consider you either barking or stupid, or both. Current Bid £31.00 with 8 days to go. Is this a new boat or has it already been spotted elsewhere? 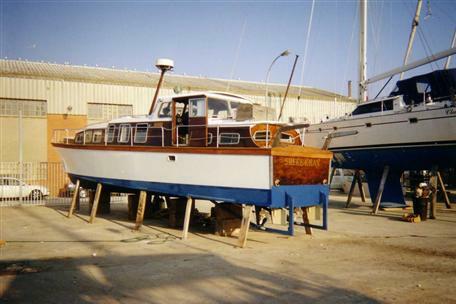 This ones in the South of Spain and they are looking for £30,000, it has been up for sale for sometime now and may have been mentioned elsewhere so my appologies if I am repeating. This boat is described as being 42ft long. 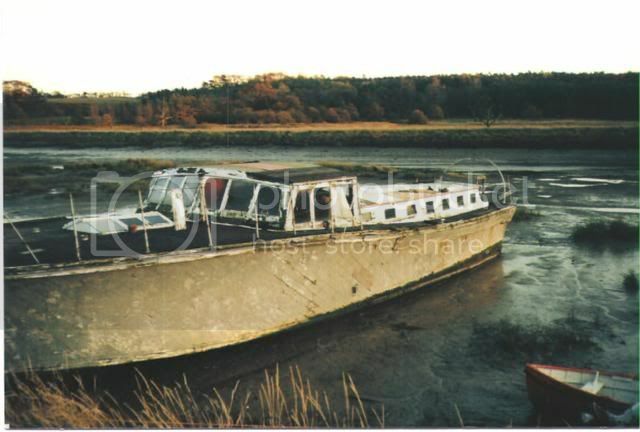 this is great boat 42ft by 11ft she started life as 1946,navel vessel then converted to motor boat by british power boat company she underwent a full 2year out of water rebuild from keel up to topsides and had 35 thousand pounds worth of work done, this was in 1996/98 she has a d/d hull with teak decks and iroko topsides windows are oversized and made of bullet proof glass for rough wheather protection she went from the uk to spain through frances river/canal system and has been used as a house boat in la manga in the costas the home of golf! for 8years the marina is top notch with access to a bay10miles across and also the med,murcia airport is 40minutes away and alicante 90minutes. Spotted this one and not quite sure what it is? The foredeck looks not unlike the late war River Class ie HUMBER, the bow looks to vertical (could be the angle of the photo) and confusingly the hull construction is described as Steel. What did the pre war Bird Class look like? This one is located on Appoloduck from the houseboat centre. One more before I log off for the night. OK one more for the road. This advert seems to have been on for a longtime now so I don't now if it is still current? 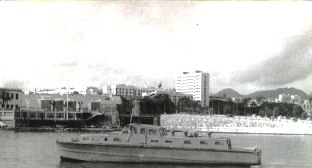 32' Seaplane Tender. Cruised, lived on and loved for the past 4 years. Built in 1938 by British Powerboat Company, Hythe for Imperial Airways. Designed by Hubert Scott-Paine (former world-speed record holder) and T. E. Lawrence (Lawrence of Arabia). Double diagonal planing teak hull, based on scaled-down Vosper patrol-boat lines, in excellent condition, demonstrating true pre-war quality. Twin turbo diesels on V-drives. Hydraulic trim tabs. Volvo Penta controls. Dual controls. Hydraulic steering. Beautifully fitted mahogany interior. Full headroom throughout with plenty of storage. Shorepower, oven, hob, fridge, sea-toilet, sink basin, califorier/boiler. Would benefit from re-wiring, which is a project I've not yet had time for. Current BW Boat Safety Certificate. A rare and appreciating classic. Lying Canary Wharf, London. Overseas posting forces sale a.s.a.p. The little 32' one above is mine now. The advert is 4 years old I guess. Well done for finding the ST (ebay item 16008313492). She is very interesting. I think the S6-M's were 120-130hp. I've asked for photos and if I get some, I'll put them up on the site. The 1945 pinnace looks good too. A nice little collection. I have a collection of information that I keep meaning to post or bin to clear my desk top. Glad to hear that the 32' is your 32'. How about making a mini registry of all the seaplane tenders that are discovered on these pages so that the are not lost again in the mists of time. I mean to do the same thing for the RTTL's, it would be nice to know the where abouts of the survivors and to have a precise record for those that haven't made it and there is always the chance of turning up a suprise ie DARK SCOUT - found that chasing after the SARO RTTL's. My job will be a lot easier as there were only 21 RTTL's Mk Ia,Ib & II. Sorry to hear about your Benetti. Be interesting to see what it goes for! Boats and outboards site is a pain, they leave boats on for years cos the contact number they want you to call is a premium rate one!! Thanks D-Zine. There are so many ST's still out there. Perhaps an owners club!! I should have checked the yard had cover for a boat her size ( they didn't). It was hidden in the small print - in French! 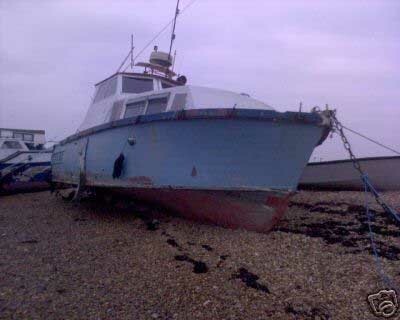 There was an almost identical pinnace on hayling island. Rougher than this one but complete & afloat. emailed chichester harbour conservancy about it but no reply, they want it gone tho. Just had a look at the pics of the Benetti fire, very sorry to see what a b...gger!. I knew I had seen it somewhere before. Thanks for your kind comments. 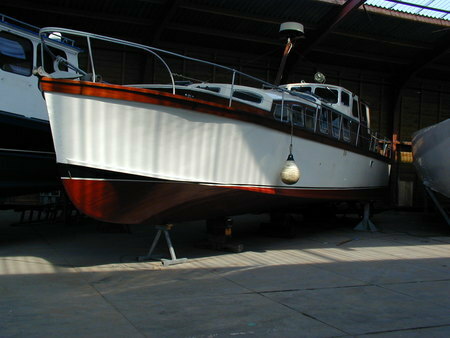 It's a slooow restoration but we hope to get her in the water this summer ( at Lowestoft). Don't worry I'm not tempted to go e.baying...yet! My boat is probably a ships boat, Christian put me onto Philip who very kindly agreed to put out some research feelers...hope to hear more soon. Started cleaning up mine, part jet washed by girlfriend on Sunday (the boat that is ), i have a .pdf with lots of pics that I can e.mail you. She is defiantly double diagonal planked on the chine only, the sides are VERTICAL planked! Not sure why yet. Found a potentially good source of bits I may need at Woods of Crediton. More work to do this weekend. I may be tapping you up for info on replacing planks....but that may be a while yet! I would be interesed in seeing how your ST is getting on if your up for visitors?! I really want to save her but my budget is limited (aren't they all!) if she is really bad and not rare then I may not be able to, not a penny gets spent till I know who/what she is...hope that doesn't sound too callous. If you get some photos, email me (don@rania.co.uk) andf I'll try to stick them on a page for you. I'll be glad to offer what little advice I can but please don't take it as Gospel. She'll be a cracker when she's done. I have e.mailed the info sheet I knocked up. I have over 150 pics on my Photobucket site now! I would still like to post a link direct to it so everyone who's interested can see them. Doing more cleaning up/out this weekend, once i have all the grotty interior out I will know a lot more, its amazing how much comes to light when you start really getting stuck in! Hopefully Philip and his "group" will have some ID info, still mystified by the vertical diagonal planking, I can almost see how the boat would act like a concertina in any sort of seas! BTW what do you think about my first modelling effort? Nearly finished, I think we post on the same Mayhem Website! I changed the link to houseboats and ST pics only. Very nice Slo-Mo, been keeping up to date on your progress on Mayhem (my user name there is CDSC123). Exciting news ref boat sales, acquisitions etc I bet Sentley's mailbox has never been so busy! BTW I dug out my old pics for Philip's new book, I will make up a quick contact sheet and post a few soon. To right but if we end up with 506 in grey it will certainly have been worth every up and down that we will undoubtedly go through before that happens. It makes me feel like an excited school boy again. The other point is the amount of unselfish help offered. If only the whole world could live like that well...... but it won't happen. "Never yield to force; never yield to the apparently overwhelming might of the enemy" WSC. Working late so time for a bit of scanning! I am assuming this is/was a Whaleback design? The boat in the background, serial number 2605 was being worked on by the owner, he was replacing an engine, one of three, which had just broken its crankshaft, apparently he had fully rebuilt the hull which had previously been in the same condition as the one in the foreground. Foreground boat now houseboat and (sorry if I offend!) starting the slow road to decline, but the 2605 boat still looking good, incl heavy compressor on deck! One other pic, not sure about ID but also in background could be a Fairmile?? Quite a few more pics to scan including the slow decline of the Meadway and Ryde Queens, starting from 1972..I think and some more patrol/house boats in York 1991, also some from Malta 1985. Be nice to know what happened to the Woodbridge "pair" may even pop up there this weekend.